Linux Fedora Core 4 Installation Process Start to Install Fedora Core 4 to Hard Disk. 1. 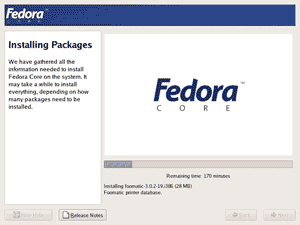 The Fedora Core installation will start with formatting the partition on the hard disk and creating file system. 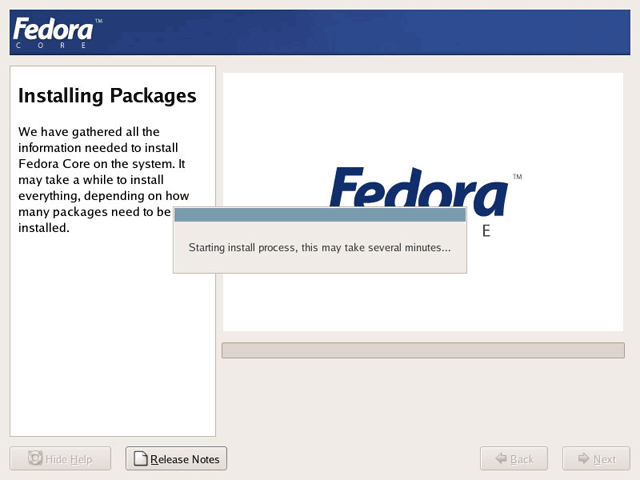 We have gathered all the information needed to install Fedora Core on the system. 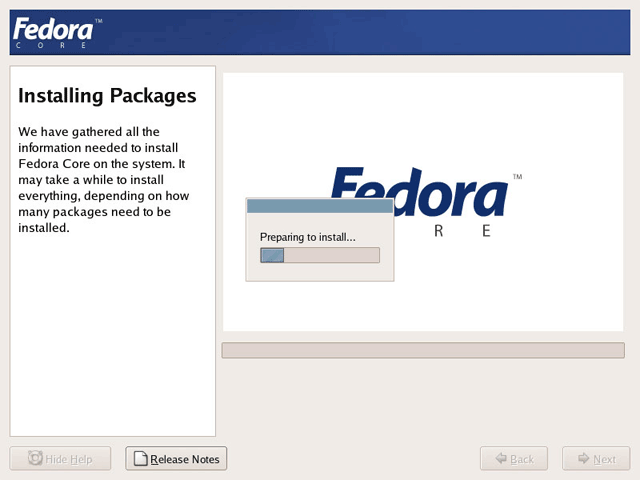 It may take a while to install everything, depending on how many packages need to be install. 2. After creating file system, then the installation process start transferring install image to hard drive. 7. 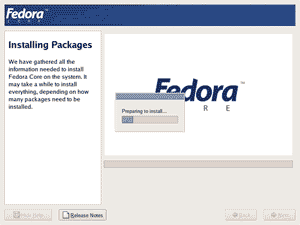 At this stage, the Fedora Core installation process usually run automatically and the only thing that require your attention is when the message box prompt user to change the Fedora Core installation media. The current installation media on the CD-ROM drive usually automatically ejected. Change the installation media to the one that is prompt on the message box. 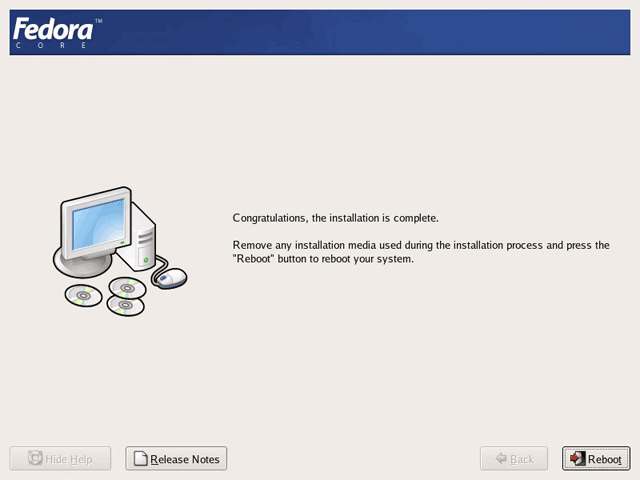 Close the CD-Rom drive and then click OK button to continue with the installation process. Insert the Fedora Core disc 2 on the CD-Rom drive and then click OK button to continue with the installation process. Insert the Fedora Core disc 3 on the CD-Rom drive and then click OK button to continue with the installation process. 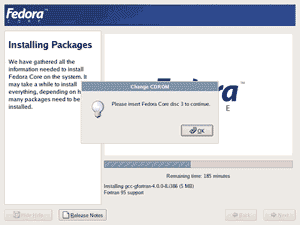 Insert the Fedora Core disc 4 on the CD-Rom drive and then click OK button to continue with the installation process. 10. 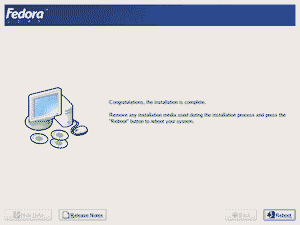 When the installation finished, a congratulation screen will appear. Remove Fedora Core installation media from the CD-Rom drive and click Reboot button to reboot the computer. All Fedora Core screenshot publish here are for educational purpose only. Suggestions and comments to improve this page or may be on the Fedora Core screenshot are welcome. 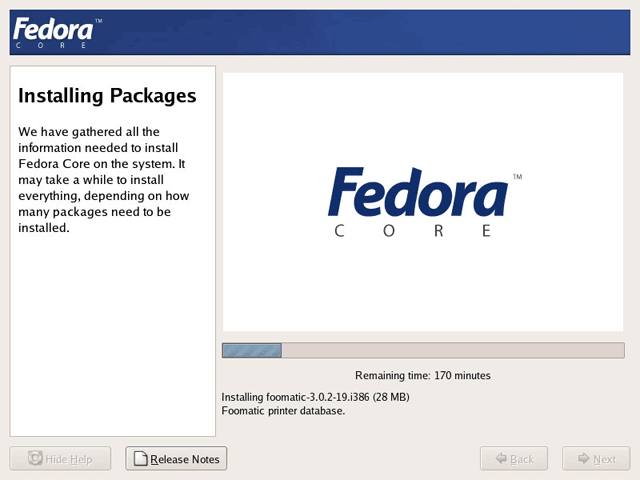 NEXT: Configure Fedora Core 4 after the first boot. Keywords: install to hard disk, install fedora to hard disk, Linux Fedora Core 4 Installation Process, Start to Install Fedora Core, Installation process continue, install Fedora to system hard disk.